This smart bracelet supports various sport mode monitor, continuous real-time heart rate monitoring and the measurement of blood pressure, make you better understanding of your own health. The bracelet not just record your exercise routine data such as distance, steps, calories burned, also automatically monitor your sleep quality during the night, help you develop a good habit. 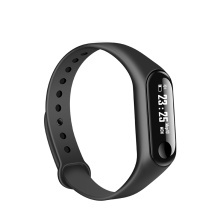 As a fitness helper, it also with functions of calls reminder, you won&apos;t miss anything important, no doubt, this product will be your intimate sports partner. Wear the smart band out in all kinds of weather. It&apos;s able to withstand dust, dirt and washing hand.